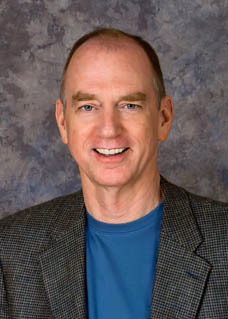 In my previous post, Uncertainty Denial, I promised to suggest a way to accept and plan for the uncertainty of future market returns rather than to deny it. Future market returns, future expenses and how long a healthy person will live are critical to your retirement plan and all are uncertain. The uncertainty is inescapable. Relying solely on averages or likelihoods in a retirement plan is risky. In this post, I’ll talk about the uncertainty of market returns and the impact that has on our ability to optimize the financial parameters of a retirement plan, like spending rates, equity allocations and how much we need to fund a safe floor of income. Let’s say you decide to base your plan on the assumption that your portfolio will return 5% annually in real dollars with a standard deviation of 11% over the remainder of your lifetime. You should have very little confidence that this prediction is in any way accurate, but let’s stick a pin in that for now and pretend that we’re pretty sure of our prediction. That 11% standard deviation quantifies the uncertainty of our estimate. It means that roughly two-thirds of the annual returns will fall between a 6% loss and a 16% gain, a pretty broad range. About 95% of those returns will fall between a 17% loss and a 27% gain. 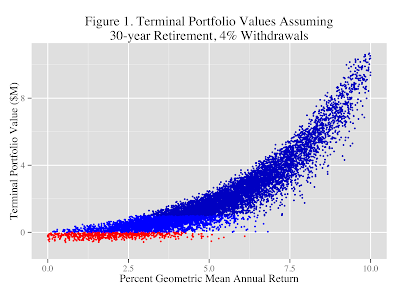 The following chart shows terminal portfolio values (wealth at death) from a Monte Carlo simulation for a retiree spending $40,000 a year from a $1M initial portfolio balance (the 4% rule) and living exactly 30 years in retirement. The red dots are scenarios that ended in ruin before 30 years. The lighter blue dots represent scenarios that survived 30 years but ended up with less than the $1M the scenarios began with. The dark blue dots represent scenarios that funded thirty years and ended up with more than the portfolio’s initial value. The probability of ruin is 6.7% for all scenarios. Figure 1 above shows a lot of uncertainty. About 14% of the scenarios had annual returns less than 2.5%, or half the expected return. About 11% had returns greater than 7.5%, or 50% greater than the expected 5%. Figure 2 below shows the same simulation as above, but adds life expectancy modeled from mortality tables for a 65-year old couple. The probability of ruin drops from 6.7% to 3% for all scenarios when we include life expectancy in the model. This is consistent with a study by Stout and Mitchell that found that considering life expectancy in the sustainable withdrawals rate (SWR) model lowers the probability of ruin by about half. That’s another way of saying that fixed-length retirement models overstate the probability of ruin. While 3% of the 10,000 scenarios ended with failed portfolios before death, 82% of those failures (1,400/1,700) occurred when returns were worst, 18% occurred with below average returns, and 0.01% occurred when returns were greater than the expected 5%. 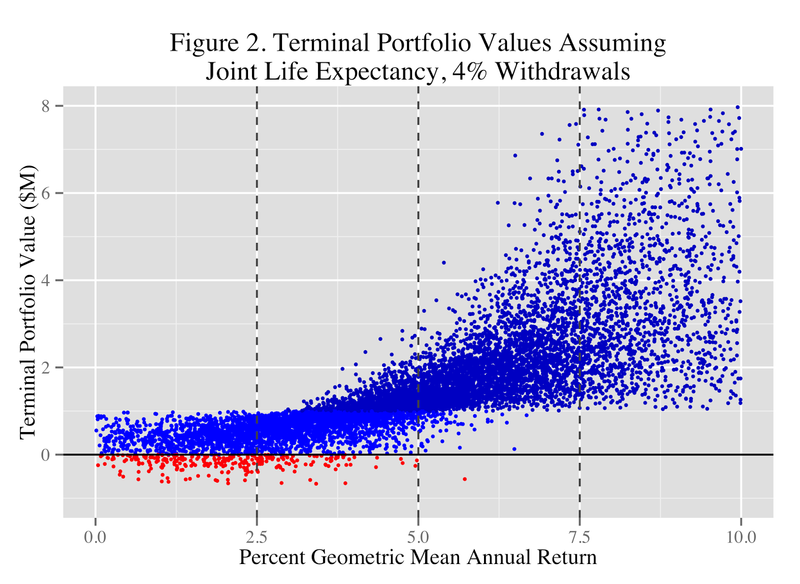 Shorter lifetimes than 30 years means less time to grow those big terminal portfolios found in the upper right quadrant of both figures, and when joint lifetimes for a couple are considered instead of assuming they always retire for 30 years, the median terminal portfolio value falls 22% in this example. Those huge terminal portfolio values from SWR studies that leave us starry-eyed are possible, but they require all four of these pieces of good luck: excellent market returns, a long life, a fortunate sequence of those returns, and no spending shocks. On the other hand, any one of poor market returns, an unfortunate sequence of returns, or spending shocks combined with a long life can be financially catastrophic. Third, notice the dots (scenario outcomes) in Figure 2 near the 5% annual return line. The outcomes range from a couple of failed scenarios (red dots) to one leaving about $3M to heirs. Outcomes range from portfolio failure to a huge success even though they all experienced a 5% average annual return on investments. Or look at the outcomes with an annual average 10% return that range from $1M to $8M. These examples illustrate sequence of returns risk. Next, notice that there is one lonely failed scenario in the Above Average Returns range and none in the Best Returns range. Had I increased the number of simulations from say, 10,000 to 100,000, more failures would show up in all ranges and a few would appear in the Best Returns range. These additional failures are improbable, but not impossible. The best range of returns is not immune to portfolio failure; failures there are just less likely. Lastly – and perhaps most importantly, if you retired 10,000 times then your history of terminal portfolio balances might look a lot like Figure 2. But unless you're Dr. Who, you only get one retirement and one of those dots. Table 1 below shows the statistics for the simulation that includes joint life expectancy. Next, let’s add rows to Table 2 for the 95th-percentile sustainable spending rate using Milevsky’s formula and the recommended asset allocation using the AACalc website. Those last two rows of Table 2 show the spending rate and asset allocation we would have chosen had we known we would end up with those returns instead of the 5% average return that we assumed. And herein lies the planning predicament. Although 5% returns with an 11% standard deviation sounded precise, it actually provides a 1-in-7 possibility of a terrible outcome and nearly a 1-in-5 possibility of a really great outcome. For which scenario do we plan? Worst Returns with 1.1% annual spending and a 15% equity allocation? Best Returns with a 5.9% spending rate and 95% equity allocation? Somewhere in the middle? A lot of plans will focus on the middle, but a good plan will consider them all.